The latest Spectrum Poll shows voters probably aren’t sold on all six proposed constitutional amendments. A number of factors, including coordinated opposition to some and the number of amendments on the ballot, may have caused this split. SurveyUSA queried 1,200 North Carolina adults on behalf of Spectrum News from Oct. 26 to Oct. 29. Of the 1,200, 1,008 were registered voters. SurveyUSA identified 659 people who have already returned a ballot or who are likely to do so before the Nov. 6 deadline. The credibility interval for the 1,008 registered voters is plus or minus 4.4 percent, and plus or minus 6 percent for the 659 voters. 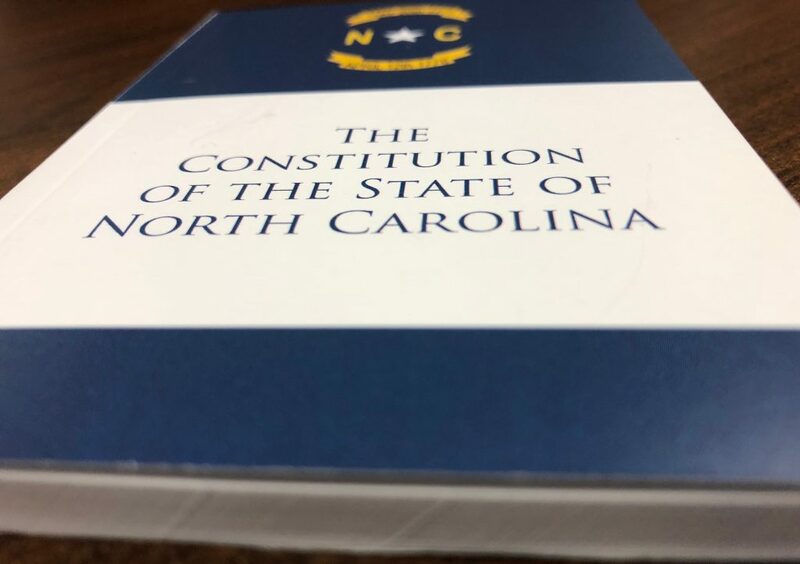 Likely voters were asked about the six proposed constitutional amendments — which were placed on the ballot by the General Assembly during the 2017 and 2018 sessions. A few seem likely to pass while others are struggling to gain traction. Specifically, the Judicial Selection for Midterm Vacancies Amendment has low approval among likely voters. SurveyUSA found that only 29 percent are for the amendment, while 51 percent are against it. Twenty percent are undecided. The Legislative Appointments to the Elections Board Amendment also has low approval, with 37 percent supporting it and 47 percent against it. Seventeen percent are undecided. Marsy’s Law, or the Crime Victims’ Rights Amendment, has the most support on the Spectrum poll. Of the 659 likely voters, 65 percent support the amendment, and 27 percent are against it. The remaining 8 percent are undecided. Like Marsy’s Law, the Right to Hunt and Fish Amendment and the Voter ID Amendment have majority support. A majority of likely voters — 59 percent — support the Right to Hunt and Fish Amendment, while 31 percent are against it. Similarly, 56 percent of likely voters are in favor of the Voter ID Amendment, and 38 percent oppose it. SurveyUSA said the Income Tax Cap Amendment is too close to call. Forty-seven percent support the amendment, but 41 percent are against it. Twelve percent are undecided. While some of the amendments still have a majority of likely voters supporting them, all have seen a decrease in support. Jonathan Kappler, the executive director of the North Carolina FreeEnterprise Foundation, cited several possible causes for the dip in support. Marsy’s Law, which has enjoyed a better funded and more organized support campaign, hasn’t dipped in approval as much as the other amendments. Similarly, the Right to Hunt and Fish Amendment hasn’t seen much organized opposition. Kappler said the amendments that deal mostly with governmental processes, including the judicial vacancies and the election board appointments, aren’t very familiar to the average voter. Those who are heavily involved in politics and pay close attention see those amendments as a proxy fight between the Democratic executive branch and the Republican controlled legislature. “I think voters who don’t necessarily understand that political framework look at that and see that they’re wordy and there doesn’t seem to be a compelling reason for those amendments,” Kappler said. There are more constitutional amendments than usual on the ballot, which Kappler said may lead voters to discount them. SurveyUSA also asked likely voters who they would vote for in the upcoming election. Democratic candidates are ahead of their Republican and third-party opponents on the generic ballots. For the state legislature, 43 percent of likely voters said they would vote for a Republican, compared to 46 percent who said they would vote for a Democratic candidate. Three percent said they would pick a third-party candidate, and 8 percent were undecided. On the election for U.S. House, 44 percent would pick a Republican, compared to 48 percent who would vote for a Democrat. Two percent said they would vote for a third-party candidate, and 7 percent were undecided. Anita Earls, the Democratic candidate for the N.C. Supreme Court, continues to lead in the polls against her Republican opponents. Of the 659 likely voters, 44 percent said they would vote for Earls; 22 percent would pick the Republican incumbent Barbara Jackson. Chris Anglin, who switched his party registration from Democrat to Republican before filling for the election, was picked by 19 percent of likely voters. Sixteen percent are undecided. SurveyUSA asked likely voters how much of a role President Trump plays ahead of the November election. Forty-five percent said they were more likely to vote for a Democratic candidate, while 30 percent said they were more likely to vote for a Republican candidate. Twenty-three percent say the president has no impact on their vote.